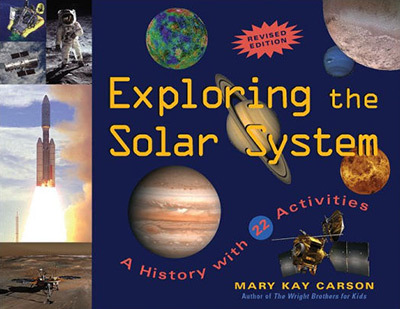 Exploring the Solar System is a chronological history of the growth of human understanding of the sun, planets, and other bodies that make up the solar system. The first two chapters review everything up to 1950, and the remaining six chapters are devoted to one decade each. The book also has an appendix that includes a summary of knowledge about each of the major bodies in the solar system as of 2008. As the author of a reference book for young adults (Space and Astronomy: Decade by Decade) that covers some of the same material, I read this book with perhaps a more critical eye than other reviewers might. The book held up well under this extra scrutiny, though I did find a few errors. Simple diagrams, such as a drawing of how planets appear to stop and go backwards, complement the text. An outstanding feature of the book are a number of uncommonly seen photos including a color photo of the first orbiting dog Laika, the first group of cosmonauts with Korolev, the Soviet Lunakhod rover, and a stunning Galileo image of Jupiter’s cloud tops. Another outstanding feature is the inclusion of quotes from “ordinary” scientists such as astronomer Rosaly Lopes who studied volcanoes on Io. Also, short profile sidebars of famous scientists and explorers (von Braun, Gagarin, Sagan, Kuiper, etc.) were scattered throughout the chapters, making the book a history, not just of the solar system, but of the people who made that history possible. Some of the activities (orbital ellipse, Alka-Seltzer rockets, etc.) are duplicated elsewhere, but readers will appreciate having so many in one book. My favorite was the “Walk to Pluto” that aptly demonstrates the relative distances between worlds. I consider “Is It Organic?” to be a potentially dangerous activity involving microwaving sugar and salt on a piece of paper for five minutes — very likely to cause a fire! Adults should definitely supervise. Also, it is unclear how this activity demonstrates the presence or lack of carbon since paper itself is organic. Another questionable activity is making a comet from dry ice that includes a household ammonia product in the mix. Dry ice may freeze out the water in the cleaning product and cause the release of (toxic) ammonia fumes. If the purpose is to see vapor released like in the tail of a comet, ammonia really isn’t necessary. The “Planetary Warm-Up” activity does not show “how colors, like different kinds of atmosphere, soak up heat” by comparing thermometers in a clear and a green plastic bottle in the sun. Will a child conclude that greenish Uranus is hotter than the “clear” Moon? That white Venus is cooler than orange Mars? Also, digital thermometers don’t measure “air” and outdoor thermometers are too large to fit in a bottle. Most thermometers go off scale high in Houston’s sun. In the discussion about planets wandering in the sky (pg 2), it says “unlike stars, planets really do move.” All stars move but their motion is not as noticeable from Earth because of their distance. In 1909, an astronomer did not prove there was no water in the atmosphere of Mars (pg 15). Instead, Vesto Slipher used spectral lines to confirm water in 1908 (Lowell and Mars by William Hoyt). Korolev (pg 28) is no longer considered to have died because of a botched operation (Korolev by James Harford). He had cancer and a weak heart. The big bang theory derived from general relativity, not Hubble’s discovery (pg 102). Hubble provided evidence. Astronauts may get stomachaches (pg 135), but I don’t think organs moving around has much to do with it. Pioneer 1 did not discover the solar wind (pg 138). It may have provided some data, but Eugene Parker is credited with the discovery based on eclipse and comet data prior to Pioneer’s flight. Neptune’s great dark spot (pg 156) seen by Voyager 2 was gone by 1994. The only serious science error is the explanation of gravity assist. An object will not be captured by a planet simply because it passes close by (pg 74). If that were true, Earth would have a swarm of orbiting asteroids that barely missed us. Gravity assist works by transferring momentum, the product of mass and velocity. Basically, the spacecraft speeds up because the planet slows down, not because “as the spacecraft swerves, it is now being dragged through space along the planet’s speedy orbit.” Imagine squirting water on a spinning bike tire. If the water is going the same direction as the tire, it will be sped up, but also slow down the tire. Exploring the Solar System is a solid history, full of information, stories of scientists, lovely photographs, and some worthwhile activities. At 168 pages, it offers more detail than books for younger readers, though without the technical language often found in many books for adults. Recommended.